The people behind this project are all wine lovers that decided one day (over a few bottles of wine) to make a dream come true by making honest, iconic wines together. The label features the fingerprints and signatures of all the owners. The design goal was to convey a highly personal, hands-on project, undertaken by a group driven by friendship, passion and quality for all facets of life. The British Master of Wine, and an award-winning journalist, Tim Atkin has recently rated Argentina’s wines and we are very pleased to announce Alpasion wines scores. 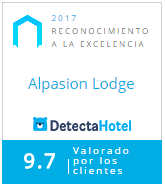 The food at Alpasion Lodge has always been a highlight and one of the many “reasons to come back” amongst guests and visitors. Learn how you can invest in the Alpasion project and become part of this amazing experience!